Just use the code FESTIVE20 to save. Missed our Black Friday sale? 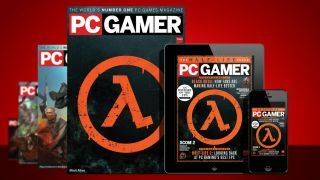 You can save an extra 20% off all PC Gamer subscriptions today only by clicking here and using the code FESTIVE20. This applies to both US and UK versions of the magazine—the link will autodetect whichever territory you live in. For US residents, this means a year of PC Gamer to your door for just $19.20. For UK readers, this is on top of our already discounted holiday sale prices, meaning you can subscribe to the print version of the magazine for under £3.50 an issue if you live in the UK, which is a massive saving. You'll also get downloadable gifts every month and exclusive subscriber covers with the UK print edition. The same deal also applies to our hardware-focused sister magazine Maximum PC. US residents can get this for just $19.20 with the code FESTIVE20. Prices vary depending on where you live, but it's 20% off everything regardless of where you live. This offer ends at 16.30 UK time on November 7th. That's tomorrow or today, depending on when you're reading this. Be quick!